He was a very wealthy man with a long and established career as an entrepreneur. He sat there in the executive conference room, rubbing his beard with his left hand in deep thought. Lower on his wrist resided a very expensive Rolex. Nice things, strong financial portfolios, successful companies — this was his usual experience. Having developed a life long habit of building new companies, growing them, and building some more, stopping wasn’t a familiar formation in his playbook. So much preparation and so many resources had been laid out to move forward. Yet, the people he hired and trusted, said it was time to stop. About 3 years ago, I was privileged to be part of a hand picked consulting team hired by a venture capitalist from California. He was becoming increasingly interested in building and expanding on his portfolio of companies. Having been in finance and service based industries for a long time, he was flirting with the idea of getting into healthcare. And after all, everyone else was doing it, healthcare was a service, and, why not him? For decades, he had been successful because he did things better and faster than all his competitors. It was time for him to make his move. However, he would not do so without sound input from field experts. After all, he didn’t get to where he was without considering sound advice from industry leaders. As it came to pass, I was pulled into this team of all stars to represent the Rehabilitative Therapy concern in healthcare. I was doubly invited due my background as an Electronic Medical Record (EMR) super user from the “old days.” Of course, my background in engineering didn’t hurt the prospect of added value across this group. As the process of market entry analysis and resource preparation came to maturity, we came to a moment of truth. Despite the fact the team was able to prescribe precise action steps for market entry, we found something amiss which required revisitation. There was an imbalance in competitive forces. Many business school programs reference Porter’s Five Forces of Competition as a go to framework for analyzing the competition. The 5 forces are represented by internal rivalry within the industry, the power of suppliers, the power of buyers, the threat of substitutes, and the threat of new entrants. Within this framework also exists sub-forces such as barriers to entry, power of incumbents, brand equity, etc. The sector of healthcare the venture capitalist wished to enter had only recently experienced a sudden surge in internal rivalry forces. While the threat of substitutes was comfortably low, the threat of new entrants was rather high. After all, he himself was considering entering this space. The bargaining power of suppliers where becoming quickly increasing. Since this sector was starting to blossom, the demand for suppliers was increasing at an astronomical rate to the point they could essentially call their own shots. Finally, there were several sub-forces that made the situation entirely less comfortable. Primarily seen in rivalry and new entrants, it was becoming apparent that this particular ecosystem was not only about to get very crowded, it was also going to become a battleground of mergers and acquirers. There were simply too many high level forces in the prospective market. Fortunately, with all these identified warning signs, our recommendation to halt market entry was heeded. And, it was a good thing too. In just a matter of months, the intended market of entrance became both saturated and unstable. Too many players who joined the fray too quickly created an environment of multiple aggressive takeovers and mergers. Despite the revenue potential being as enticing as it was, the risk of negative return on investment was simply too obvious and too high. Certainly, a market entry could have been made and a battle could have been won against incumbents and against takeovers. But, being that all the other new entrants suffered a quick fate, the cards just weren’t stacked in favor of such a move, however calculated it may have been. 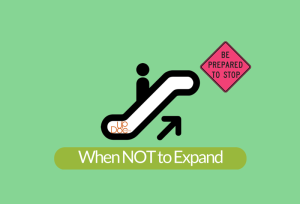 Sometimes, it’s better not to expand or enter a new market. In this case, the cost of market entry and aggressive expansion to scale would have been more a drain on this venture capitalist’s resource ecosystem than would have been advised. He was ultimately very happy about the small margin of money spent for a consulting team versus the exorbitant amount he would have spent otherwise in his original intent to enter healthcare. The timing, simply wasn’t right. Fortunately, being that he was advised in this direction, he was able to make certain moves in his other companies as a service substitute to all the firms in this space of healthcare. Indeed, he was able to take advantage of the competitive forces where they were weakest and developed a clever way of existing in the market he wished to enter without needing to fully and formally invest all his resources as yet another rival. Rather, he became a marketplace ally to the companies who desperately needed help in a hostile ecosystem — success by way of detour. If you enjoyed this case study, you can find our other case studies here. And, if you wish to learn more about the tools we use for business optimization, you can get started by signing up for your free Business Renovations situation analysis. Thank you for reading this post from October of 2015. 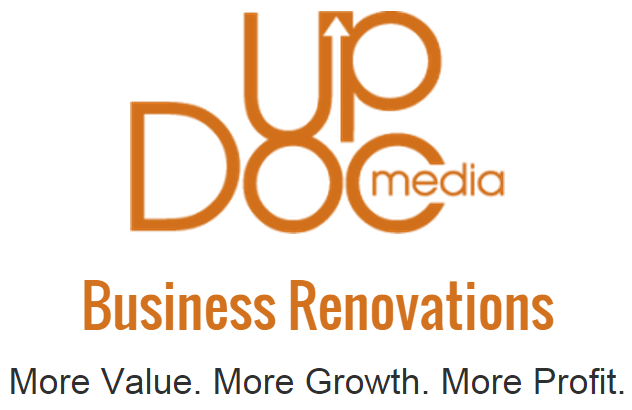 UpDoc Media has since shifted from Business Renovations and now offers a Digital Media & Content Marketing service called POWERED By UpDoc Media. Woven into this service includes management consulting as well as business coaching.